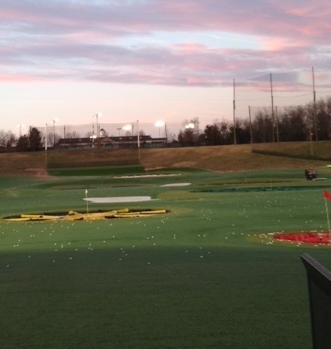 Living in Northern Virginia has a few benefits when it comes to golf. Some great courses, extended seasons, multiple Golfsmith locations, and some good cart girls, but perhaps the greatest gift to golf that NOVA offers is the combo skee-ball / driving range concept of Top Golf. .For those of you who haven’t had the please let me paint a picture for you. Imagine going to your favorite driving range. It has two-tiers of booths and ball dispensers and color targets down range. Now add to that RFID implanted golf balls, range booths with high top tables and bar stools, wait staff bringing you bar food and beer, and a computer monitor to facilitate golf games based on your shots. Yeah it’s that good. It is as close to heaven as it gets on cold winter days when you can turn on the overhead blast heaters and compete in target golf games while drinking beers with your friends. For those really concerned with getting your game “tour ready” sure you can tee it up and work on your distance control and pat yourself on the back for getting a bulls eye but Top Golf is more about driving range meets Buffalo Wild Wings. It’s awesome. Not to mention you can take your short game skills over to the mini golf courses and really work on your entire game. So if you are lucky enough to live close to their few locations you owe it to yourself as a golfer, drinker and/or American to go spend some quality time at Top Golf. You won’t regret it. This entry was posted in Course Review, Jon. Bookmark the permalink.